Bears are dominating the oil market. Hedge funds cut bets on rising West Texas Intermediate crude prices by 31 percent in the week ended June 20, pushing their net bullish position to the lowest in 10 months just as the U.S. benchmark slipped into a bear market. Wagers on declining prices reached a new high for the year. WTI and Brent, the global benchmark, both entered bear-market territory last week, meaning prices have fallen more than 20 percent from this year’s peaks. Weighed down by rising output from the U.S., Libya and Nigeria, the oil market has now given back all of its gains since OPEC led an historic agreement late last year to cut production. Money managers’ WTI net long positions, the difference between wagers on a price increase and bets on a decline, fell by 60,556 to 134,742 contracts, according to data from the U.S. Commodity Futures Trading Commission released Friday. Long positions fell by 5.7 percent to 301,476, the lowest in almost eight months, while short positions grew by 34 percent to 166,734, the most since August, the CFTC said. Bets on falling gasoline prices reached their highest level in six weeks while bearish positions on diesel were the largest in a year and a half, according to the CFTC. Oil prices notched their fifth weekly decline last week. 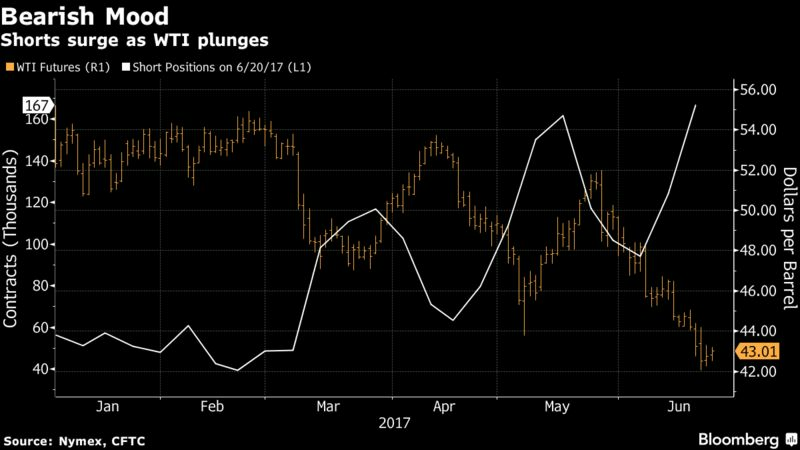 Sentiment took another hit after talks in Vienna between the Organization of Petroleum Exporting Countries and allies including Russia. The producers focused on how to deal with surging Libyan and Nigerian production but didn’t have a serious discussion about deepening output cuts by other members, according to delegates familiar with the talks. WTI for August delivery on Monday rose as much as 1.4 percent in New York after falling 3.9 percent the previous week. The contract was trading up 1.2 percent at $43.54 a barrel as of 12:01 p.m. in Singapore. The CFTC numbers showed about twice as many money managers took long positions as short ones, compared with a peak of almost 12 times more longs in February. That could be a sign the sell-off has reached its limit, Thummel said. “It’s near the lows of what it’s been this year, which to me signals that we’re closer to a bottom,” he said. Follow Businessamlive on Twitter and Facebook.